T’ai Chi Chih® (TCC) is a gentle discipline based on ancient principles capable of bringing peace and serenity to those practicing regularly. T’ai Chi Chih® consists of 19 movements and 1 posture which circulate and balance Chi, the intrinsic energy within each of us, to quiet the mind, balance our emotions and increase our energy. T’ai Chi Chih® is not a martial art; it is not related to any form of violence. Movements are practiced slowly, gently, with no physical contact with others. Originated in 1974 by American T'ai Chi Master, Justin Stone, in Albuquerque, NM, T’ai Chi Chih® is taught worldwide by a network of accredited teachers. The T'ai Chi Chih® Association's board of directors and the Guide of T'ai Chi Chih® continue to guide and support the teaching community. Justin Stone wrote, “the circulation and balancing of the Chi is the great secret of life”, and encourages all of us to “practice, practice, practice.” Mr. Stone lived into his 90s and passed away peacefully on March 28, 2012 in Albuquerque. He speaks to the TCC community through his writings in the Vital Force, The T’ai Chi Chih News, and through books and recordings on meditation, T’ai Chi Chih®, and personal philosophy. In Spiritual Odyssey, he wrote: ”T’ai Chi Chih® becomes a way of life. 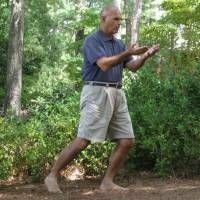 It is true that the gentle movements of T’ai Chi Chih® form a moving meditation and an exercise of great efficiency – exercising the inner organs and promoting healing – but eventually it goes beyond these and permeates the life-style of the practitioner. We do not all see the same world, which is a reflection of ourselves. With the accumulation of Chi (Vital Force) through T’ai Chi Chih practice, permanent changes in the metabolism and the thinking process take place and renewed energy conditions the whole way of life….Joy becomes our natural heritage." TCC can be learned and practiced well enough by most people to begin experiencing benefits in a fairly short time. It is also a practice that you can spend a lifetime practicing and exploring. Entirely portable, one can practice T’ai Chi Chih® almost anywhere. TCC requires no special clothing or equipment. TCC requires some physical effort (though the effort of no effort is emphasized), an open mind, and an interest in improving life for yourself and others. T’ai Chi Chih® is referred to as Joy Through Movement within the TCC community. As you learn and practice TCC, you will come to understand why. TCC is easy and relaxing to do and it seems the whole world could benefit from its practice. We begin changing the world by bringing inner peace to our world, our initial sphere of influence.